The Taming of the Glue: Yippee! 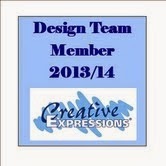 Well, I suppose you can see by the image on the right that I made it onto the Creative Expressions Design Team! I can't tell you how excited I am. Lots of gorgeous new stamps to play with, what more could a crafter want! 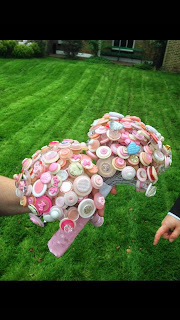 A lot of people asked to see the bouquet from the wedding in more detail so here's a better photo. It's actually both bouquets, the bridesmaids as well. I was also asked what Spirelli was. It's wrapping thread around a shape. I don't know if you ever played with Spirograph (I did, and loved it!) but it looks a bit like that! Anyway, here's a picture of the finished card to give you a better idea. Well, that's all for now as we're off to pack our waterproofs and wellies for the dig! I'll be back on Wednesday with a project for Creative Studios and I'm working on a Christmas Card using the High Low technique that the fab Sue Wilson demonstrated at Ally Pally so watch this space! Nearly forgot! The link for the Creative Studios blog is Sam Poole (it's on the right). Till next time....happy crafting and many thanks for your visit. Congratulations Pam, I knew you would do it. Your makes are always fabulous. Sorry not been around I've got cancer again, so was having radiotherapy and a tooth out at the Dentist . Also a flue jab in case I need to start Chemo again soon. Oh WOW congratulations and wow to the bouquets! I had to come to get a closer look. I've sold button bouquets (in vases) at arts and crafts fairs. They are so much fun to make. I would twist the flower wire around a wooden spoon to make it loopy. CONGRATS on making the DT team!